Uncertainties in dose delivery can originate by means of errors in daily treatment, which includes human errors, or errors in the process of calculating monitor units (treatment planning). The former class of errors will probably affect only one treatment session, but the latter can affect the whole course of treatment and more than likely many patients. A significant number of reported incidents could have been prevented by performing a redundant independent dose calculation (RIDC) prior to treatment, even more so, the International Commission on Radiological Protection (ICRP)  has indexed the task "monitor unit calculation" with a risk level of 3 being the maximum. It is widely accepted that RIDC must be included in three-dimensional conformed radiotherapy (3D-CRT) as part of the treatment planning verification. This has been recommended in the report of AAPM Task Group 40. Intensity-modulated radiation therapy (IMRT) and specifically volumetric modulated arc therapy (VMAT) requires an individualized quality assurance (QA) procedure, and RIDC should also be included in a comprehensive QA protocol. Diamond ® (PTW) is a commercial software which is capable of calculating VMAT fields. In the revised literature this software is cited for dynamic IMRT, , for VMAT there is only one reference,  proposing a validation procedure. In the present work, the results obtained in 1 year of clinical experience are analyzed. Body contour importation: Diamond includes an option to import the body contour for VMAT plans. This feature makes it possible to assign a source to surface distance (SSD) and depth of calculation, to each control point (a VMAT field is composed of 177 control point), otherwise averaged values of SSD and depth must be assigned to all control points. As said in introduction, prior to its clinical use, a software validation procedure was performed, this procedure included a separate validation for 3D fields and for VMAT fields, for better clearance a brief description of the procedure is included (a more detailed description can be found in reference 7. First, a validation for conventional (3D) fields was carried out. For this purpose, a set of fields was selected following the guidelines recommended in ESTRO documentation. For dose measurements a PTW T-31016 Pin-Point (0.016 cm3) ionization chamber, a PTW UNIDOS E electrometer, and a PTW RW3 slab phantom were used. The phantom was CT scanned with a slice spacing of 2 mm, and introduced in TPS. Fields were generated with the isocenter (corresponding to the calculation point) placed at the center of the sensitive volume of the chamber, at a depth of 5, 10 and 20 cm. The results obtained in Diamond were compared with TPS and with experimental measurements. All calculations were done including the heterogeneity correction in Eclipse. As said above, this correction can be included in Diamond by manually entering an "equivalent depth" obtained from Eclipse. This validation procedure included two different comparisons: Diamond versus TPS and versus measurements. The validation was carried out using a cylindrical phantom made of homogenous plastic, QUASAR (Modus Medical Devices), with the pin-point ionization chamber (PTW T-31016) located at its center. This phantom was CT scanned with a slice spacing of 2 mm. CT data were exported to TPS. A total of 59 VMAT plans clinically accepted were recalculated in the phantom and then were exported to Diamond where a point dose calculation at isocenter was carried out. Results were analyzed obtaining average deviations and standard deviation values from the comparisons Diamond versus measurements and versus TPS. A total of 459 clinically accepted plans were evaluated. VMAT plans can include one or more arcs, but in this paper only completed plans are analyzed. The plans were grouped by location in: Prostate (119), pelvis (82), abdomen (26), chest (84), head and neck (H&N) (87), brain (31), and miscellaneous (8). Due to particular features, two categories have been included separately: Stereotactic radiosurgery (SRS) (8) and lung stereotactic body radiation therapy (SBRT) (14). The number of plans for each category is in brackets. All treatments consist of a unique course, using a simultaneous integrated boost technique when required. The prescribed dose per session ranged between 180 and 1,800 cGy (SRS). Nevertheless, point dose values calculated by TPS and Diamond can be different from the prescribed dose due to factors such as point dose selection, calculation without heterogeneity correction, and plan recalculation in a phantom. In our center, VMAT pretreatment QA includes three independent verifications: Portal Dosimetry (Varian Medical Systems), two-dimensional (2D) absorbed dose distribution with 2D array-729 plus OCTAVIUS phantom (PTW), both analyzed in absolute mode, and a RIDC with Diamond. The plan is calculated without heterogeneity correction in the TPS and the isocenter is selected as the reference dose point. The plan and body contour are exported via Digital Imaging and Communications in Medicine (DICOM) to Diamond. Once the plan and body structure are imported into Diamond, a calculation is performed for each control point using SSD, and geometric depths derived from the body contour and the calculation point position. A review of the previous procedure must be carried out, looking for errors such as inappropriate point dose selection and problems with body contour importation. When an error is detected it must be corrected, and the procedure repeated again. This procedure is schematized in [Figure 1]. However, if the difference remains equal or higher than ± 4%, the other experimental verifications must be evaluated in order to accept or reject the plan. Being d D and d E the dose values in cGy obtained in Diamond an Eclipse, respectively. For conventional fields, the average deviation between doses calculated using Diamond and Eclipse was -0.1 ± 0.7% (one standard deviation (1SD)). Similarly, a comparison with Diamond and the ionization chamber obtained a result of 0.4 ± 0.8% (1SD). Deviations ranged between ±1.4 and ±1.9% for comparisons with Eclipse and measurements, respectively. In 1 year of clinical practice, a total of 221 fields were verified, obtaining an average dose deviation of 0.2 ± 1.4% (1SD). For the total number of plans, an average deviation of -0.3 ± 1.8% (1SD) was obtained by comparing Diamond and Eclipse. 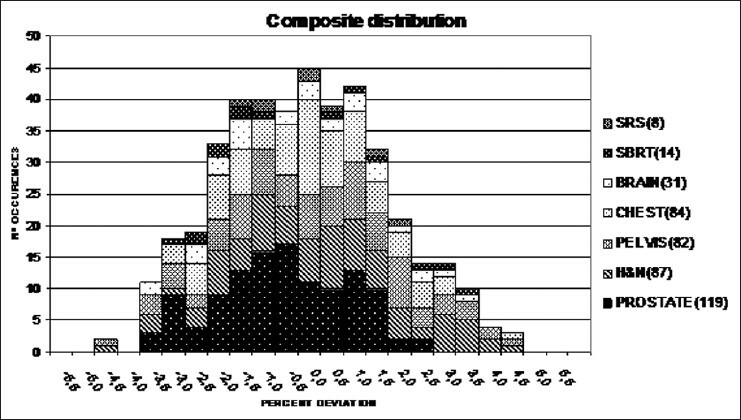 [Figure 2] shows a histogram for all deviations found. Four plans showed deviations higher than 4%, 4.5% being the maximum value obtained, and two plans had deviations below -4% with a minimum value of -5.0%. These results are very close to those obtained in the validation process (-0.2 ± 1.7% comparing Diamond versus TPS),  and are also very similar to those reported, by Al Amri et al.,  for sliding windows IMRT. The standard deviation obtained was slightly higher than in validation. This may be explained by the increase of variability inherent in the use of body contours instead of a fixed circular phantom contour, used in validation. 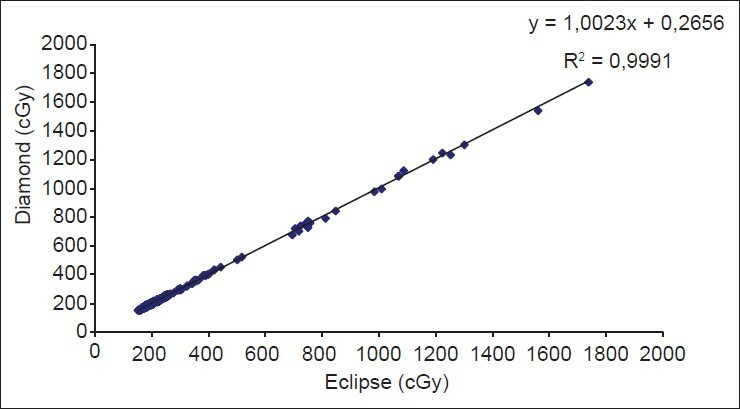 [Figure 3] shows dose values (in cGy) calculated by Diamond versus those calculated using Eclipse. A linear fit produced a slope of 1.0023, and a correlation coefficient of 0.9991, demonstrating a good match between both data sets, [Figure 3]. 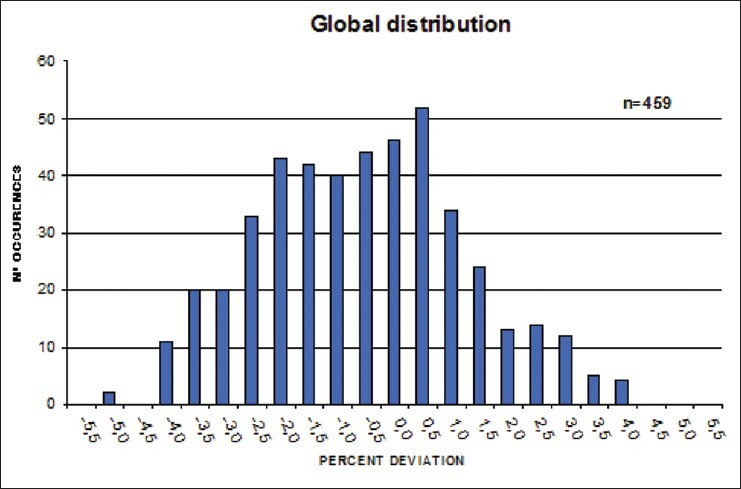 A composite distribution of deviations separated by location is shown in [Figure 4], excluding the miscellaneous group. In [Table 1], a summary of data and results is shown. The groups with higher absolute deviations were prostate and abdomen (with -0.6% and + 0.8%, respectively). The group with the highest standard deviation was miscellaneous (2.4%) followed by SBRT (2.2%). The lowest standard deviation was obtained in SRS (1.2%) followed by prostate (1.5%). SRS and SBRT groups consist of very few cases but, despite low statistical significance, they have been intentionally included in order to comment on some peculiarities: SRS and SBRT plans are similar in respect of PTV volume and shape; and because dose prescriptions are not relevant for Diamond calculations, therefore, in principle, standard deviations should be very similar in both groups. However, as previously stated this is not the case. The origin of this apparent incongruence may originate from one aspect of the calculation procedure: RIDC are made using the clinically accepted plan, but recalculated without heterogeneity correction. In the case of SRS, due to the reasonable homogeneity and almost water equivalence of brain tissue, this recalculation does not modify the dose distribution, remaining uniform inside the PTV. On the contrary, in SBRT plans the dose distribution undergoes immense change when recalculated without heterogeneity correction. Here the PTV is located inside or adjacent to lung tissue which is far from water equivalent resulting in dose gradients inside PTV being nonexistent in the original plan. Therefore, in SRS plans a suitable calculation point can easily be located, unlike in SBRT. The dose homogeneity inside the PTV can be characterized by different indexes, Yoon et al. introduced the sigma index (s-index), defined as the standard deviation of the normalized differential dose-volume histogram curve. For the SRS group, the averaged values of the s-index were 0.9 ± 0.4% (with heterogeneity correction) and 1.0 ± 0.4% (without heterogeneity correction); whilst for the SBRT group, the values were 0.9 ± 0.2 and 4.3 ± 1.3%, respectively. Thus, s-index variations, between plans with and without heterogeneity correction, were higher for the SBRT group. This result was expected because significant heterogeneities are present on this anatomical location (lung). This may explain the higher standard deviation for the SBRT group. Isocenter located outside the PTV or in a dose gradient region: In such situations, an alternative calculation point was selected in a dose homogeneous region inside the PTV. This was carried out in seven plans. Phantom recalculation: It was necessary to make a recalculation in a Phantom and carry out a check in Diamond due to uncertainties arising from the different scattering conditions in TPS and Diamond. Furthermore, recalculations were made for a few of these eight plans in which errors had occurred in the body contour import process. Once revised, the deviations of 6 of these 15 plans remained out of the interval (-4%, +4%), but within the interval (-5%, +4,5%). Nevertheless, these plans were accepted for clinical use due to the results obtained in the other two verifications included in our QA protocol. During the validation procedure,  2 out of 59 plans showed a deviation out of the interval (-3.5%, +3.5%), this represents a 3.4% of the total plans. In clinical practice 7 of 459 plans were out of that interval, being 1.5% of the total cases in study. This problem forces us to recalculate in a homogeneous phantom and this new geometry can deteriorate the dose distributions and makes it difficult to choose an appropriate point dose calculation. The default point dose is the isocenter. This criteria is appropriate for 3D plans because the dose distribution is, usually, quite homogeneous around this point. But for VMAT plans, high dose gradients can be present. In such cases, a new point dose must be selected in a more homogeneous dose region. This correction cannot be included in our version of Diamond software for VMAT fields. This forces us to recalculate the plan in TPS without correction, for comparisons with Diamond. These limitations and sources of error must be taken into account when establishing the treatment QA workflow. Our 1 year experience results are very similar to those obtained in the validation procedure. 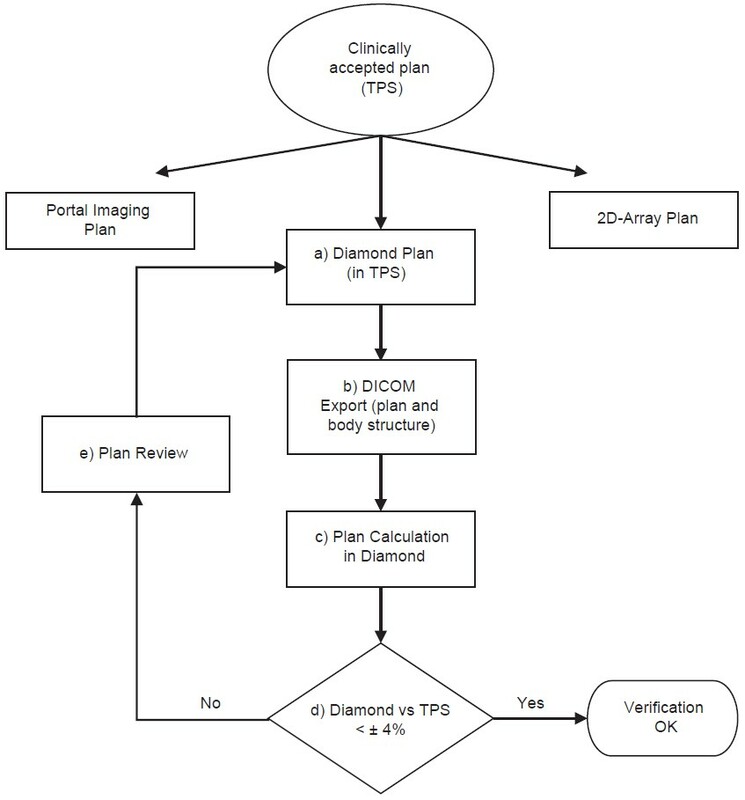 This led us to consider Diamond a valuable tool for QA in VMAT plan and to stress the need to perform a comprehensive and detailed validation procedure before its clinical use. Salomons G, Kelly D. Software safety in radiation therapy. J Med Phys 2013;38:1. Ortiz LP, Cosset JM, Dunscombe P, Holmberg O, Rosenwald JC, Pinillos AL, et al. ICRP publication 112. A report of preventing accidental exposures from new external beam radiation therapy technologies. Ann ICRP 2009;39:1-86. Ezzell GA, Galvin JM, Low D, Palta JR, Rosen I, Sharpe MB, et al; IMRT subcommitte; AAPM Radiation Therapy committee. Guidance document on delivery, treatment planning, and clinical implementation of IMRT: Report of the IMRT subcommittee of the AAPM radiation therapy committee. Med Phys 2003;30:2089-115. Sivakumar SS, Murthy KK, Davis CA, Ravichandran R, Kannadhasan S, Binukumar JP, et al. Clinical implementation of dynamic intensity-modulated radiotherapy: Dosimetric aspects and initial experience. J Med Phys 2008;33:64-71. Al Amri I, Ravichandran R, Sivakumar SS, Binukumar JP, Davis CA, Al Rahbi Z, et al. Radiotherapy pre-treatment dose validation: A second verification of monitor units (MU) with a commercial software. J Med Phys 2012;37:235-9. Mata Colodro F, Serna Berná A, Puchades Puchades V. Dosimetric validation of a redundant independent calculation software for VMAT fields. Phys Med 2013;29:341-9. Van Esch A, Tillikainen L, Pyykkonen J, Tenhunen M, Helminen H, Siljamäki S, et al. Testing of the analytical anisotropic algorithm for photon dose calculation. Med Phys 2006;33:4130-48. Sievinen J, Ulmer W, Kaissl W. AAA photon dose calculation model in Eclipse. Palo Alto (CA): Varian Medical Systems; 2005. Ezzell GA, Burmeister JW, Dogan N, LoSasso TJ. Mechalakos JG, Mihailidis D, et al. IMRT commissioning: Multiple institution planning and dosimetry comparisons, a report from AAPM Task Group 119. Med Phys 2009;36:5359-73. Mijnheer B, Olszewska A, Fiorino C, Hartmann G, Knöös T, Rosenwald JC, et al. Quality assurance of treatment planning systems: Practical examples for non-IMRT photon beams. 1 st ed., Vol. 1. Brussels: ESTRO; 2004. Serna A, Puchades V, Mata F. Acceptance for clinical use of a treatment planning system with IMRT and VMAT techniques. Rev Fis Med 2011;12:187-96. Dose Calculation Management Software. User's Manual. DIAMOND Edition. Setup 2000. K&S Associated, Inc. 1929 Elm Tree Drive, Nashville, TN 37210 USA. July; 2009. Chan J, Russell D, Peters VG, Farrell TJ. Comparison of monitor unit calculations performed with a 3D computerized planning system and independent hand calculations: Results of three years clinical experience. J Appl Clin Med Phys 2002;3:293-301. Haslam JJ, Bonta DV, Lujan AE, Rash C, Jackson W, Roeske JC. Comparison of dose calculated by an intensity modulated radiotherapy treatment planning system and an independent monitor unit verification program. J Appl Clin Med Phys 2003;4:224-30. Mijnheer B, Olszewska A, Fiorino C, Hartmann G, Knöös T, Rosenwald JC, et al. Quality assurance of treatment planning systems practical examples for non-IMRT photon beams. ESTRO; 2004. Yoon M, Park SY, Shin D, Lee SB, Pyo HR, Kim DY, et al. A new homogeneity index based on the statistical analysis of dose volume histogram. J Appl Clin Med Phys 2007;8:9-17.